Rutland Square can be found by following Rutland Street off the junction between Princes Street and Lothian Road. It’s surely one of the quietest residential areas so close to the epicentre of the city. 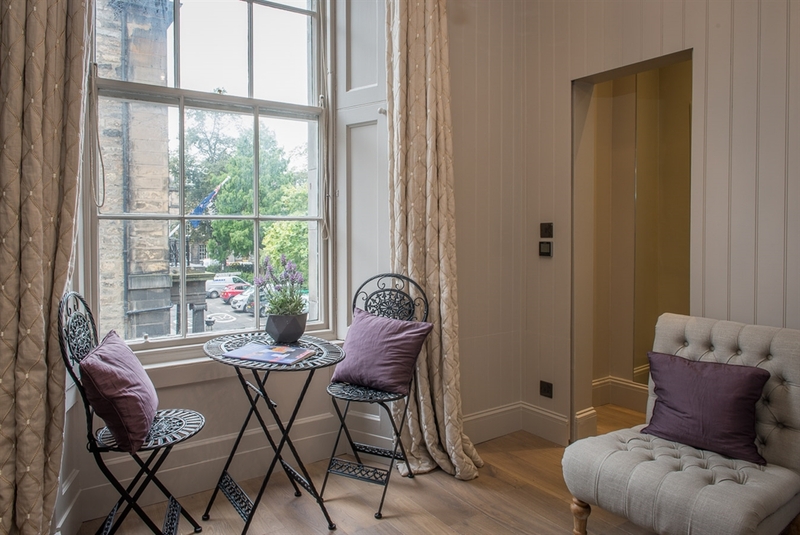 Shandwick Place around the corner is ideal for everyday essentials, while Princes Street is lined with iconic retailers, bolstered by the surrounding vicinity: Waverley Mall opposite, John Lewis just beyond, and Harvey Nichols and Multrees Walk on St Andrew Square. Edinburgh Castle and the host of other attractions along the Royal Mile are also within easy walking distance. 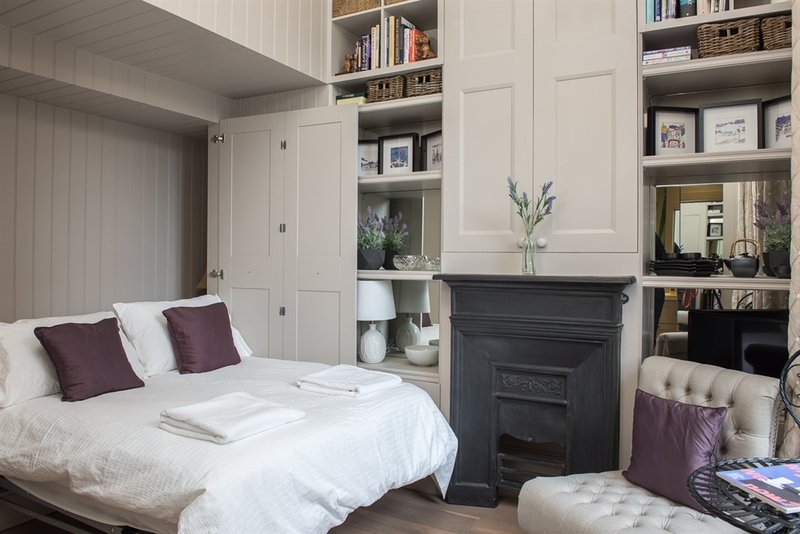 This first-floor Edinburgh self-catering apartment is a compact and tastefully decorated space. 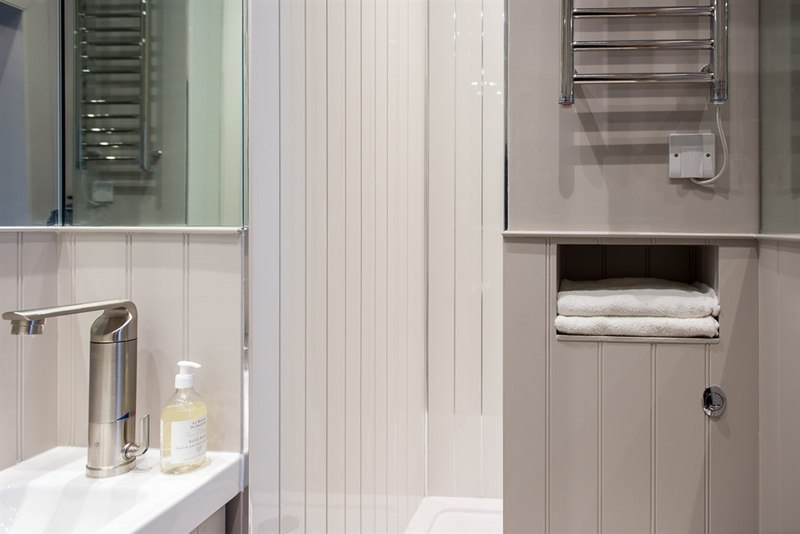 The décor is predominantly a warm grey with a purple hue which emerges in the waning light. 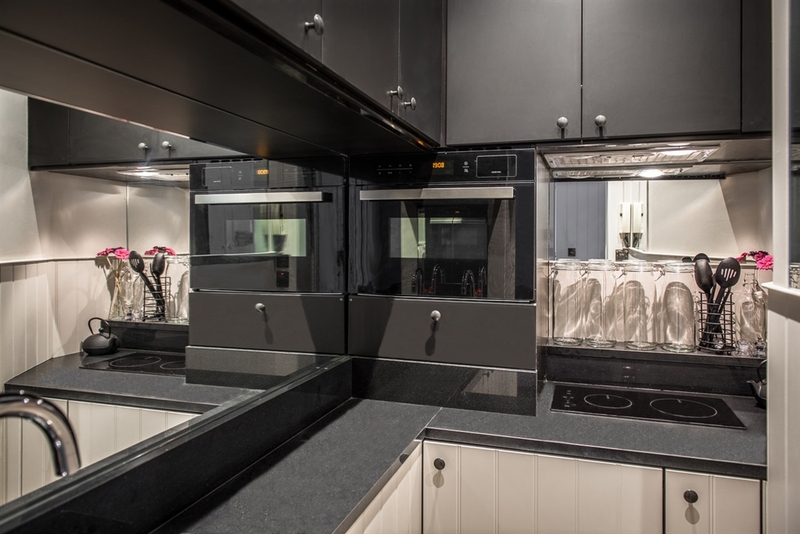 The kitchenette with resplendent granite worktop is separated by a sliding door and contains a steam/convection microwave-cooker, a boiling tap and an induction hob in addition to the fridge and essential food utensils. The main living space comprises a dining table for two by the window with working wooden shutters and thick embroidered blackout curtains. There are two plush opposing chairs and the double bed retracts from the inner wall, with the added conveniences of a second light switch for the room within its recess, as well as USB charging ports so that guests need not worry if they don’t have UK power adapters. 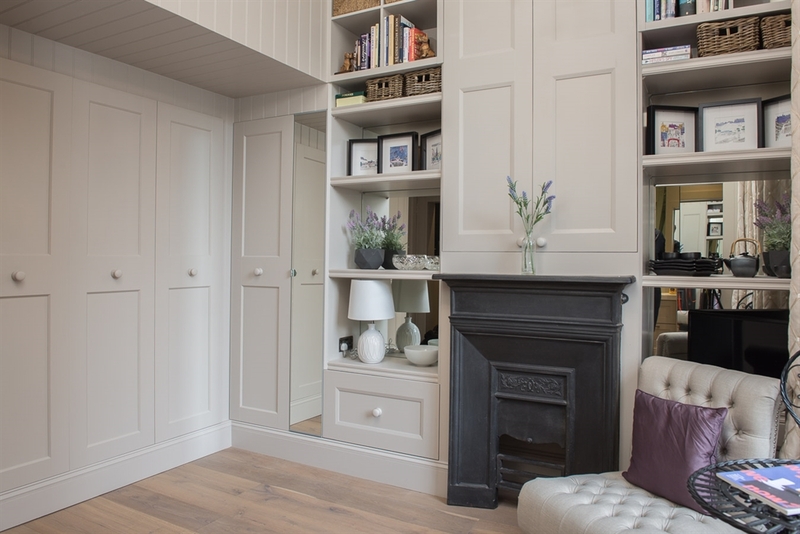 An adjacent fitted wardrobe with mirror provides for clothes storage, with a hairdryer and iron in the drawer underneath. The central storage above the decorative hearth contains a vacuum cleaner and ironing board, while a dishwasher and washing machine occupy the cupboard opposite. A 24-inch HD TV sits in the shelf beside the hearth. 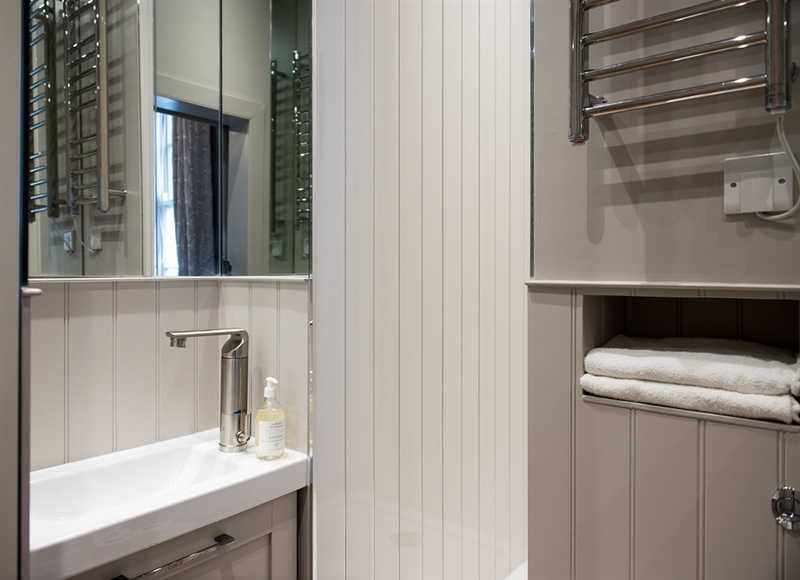 The ensuite shower room also has a sliding door and is walled with mirrors, with a heated towel rail and beautifully finished shower alcove featuring an electric power shower. 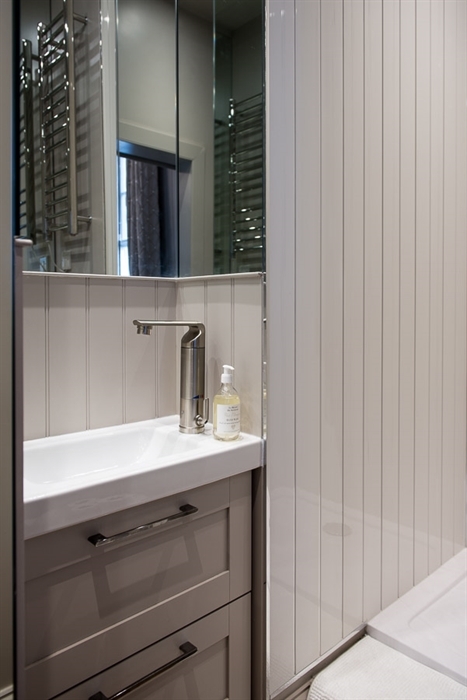 Rutland Square is extremely space-efficient and finished to an impeccable standard. 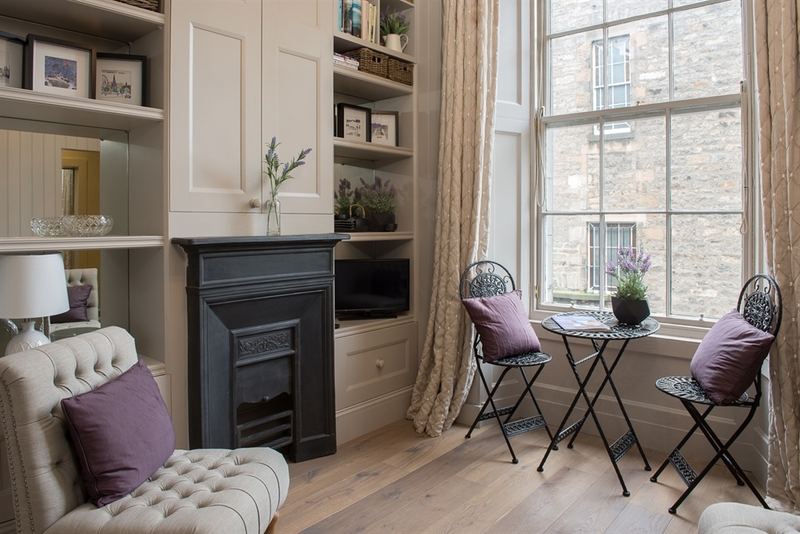 It’s an enticing flat for a single traveller or couple who need to be as close as possible to central Edinburgh and who have an eye for aesthetics.